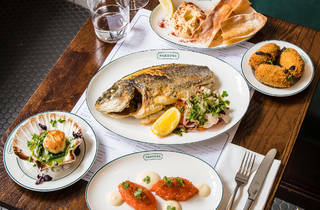 A Covent Garden seafood restaurant from the team behind The 10 Cases. When you walk into Parsons, here’s what I want you to do: look up. Because, dangling high above the door, is a carousel of everyone’s coats. They’re placed on proper hangers, then lifted on to a circular rail with a long, hook-ended pole. (Well, that’s one way of making sure nobody does a runner.) The same savvy approach to saving space is a bit of a theme. 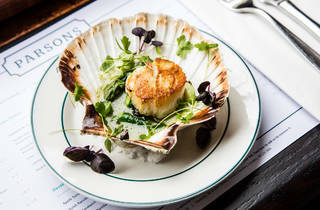 Every inch of this bijou Covent Garden fish restaurant – from the people behind the wine-loving 10 Cases across the road – has been put to good use. Like having a tiered service bar in the centre of the dining room, with different levels for beer taps, wine bottles and hanging glassware. What this means is that there’s more space for eating. Which is A Very Good Thing. Because the food is excellent. 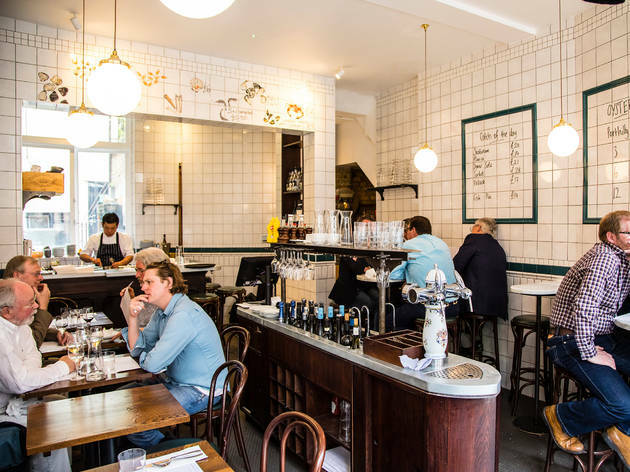 Fish arrives fresh off day boats, with specials – grilled sardines, say, or dover sole – scrawled on the tiled walls or mirrors. These are a safe bet if you like your seafood simple. But for something more memorable, do have a rummage through the snacks. That’s where you’ll find the cod roe. An enormous dollop had been casually smeared on the plate. On top, it had a slight depression, like a crater, filled with good olive oil and a dusting of paprika. 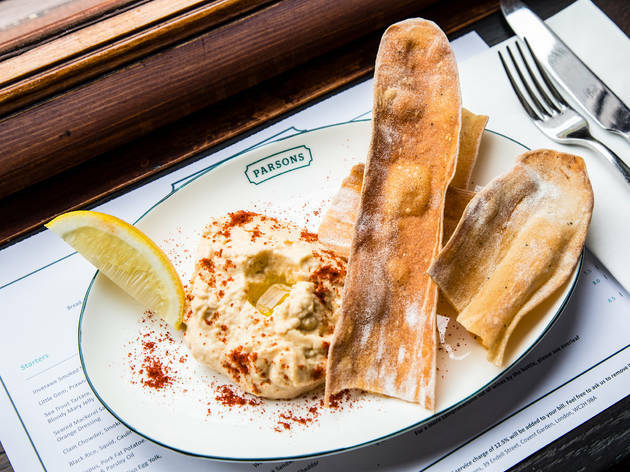 To the side, there were parchment-thin crackers (aka carta di musica, though they’re far too unpretentious to actually call them that). 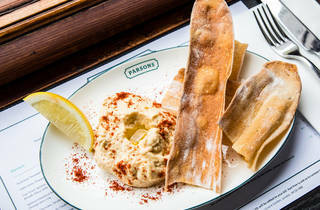 The classier cousin of taramasalata, the dip was creamy, salty and silky, with the tang of citrus. It was the colour of eggnog and the taste of an evening on the beach. In short, it was beautiful. Potted shrimp croquettes were pricy (£8 for three) but otherwise great: shrimp-studded soft potato with the faintest hint of heat, all wrapped in an outrageously good, piping hot, crisp coating (deep-fried panko breadcrumbs, obvs). And a plate of sea trout tartare was stunning: two oval mounds of thick-cut, tangerine-hued fish so fresh it was almost sweet, layered with a tooth-suckingly tart bloody mary jelly and a few snip-snips of micro-herbs. Orbiting these two moons: four blobs of silky mayo, each of them a random size. Parsons, you see, is a place of passion, not pedantic precision. Sadly, the fish pie ‘special’, was not that special. The individual ingredients were good (plenty of sparkly fish, plus the trad additions of boiled eggs and spinach), but the end result was too dry. Still, staff are fantastically friendly and know their wines inside-out – ask for help, then let them do the rest. 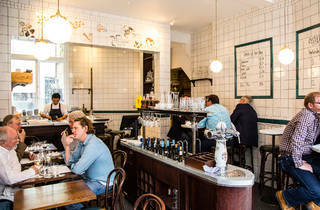 It’s also a relaxed space, with the look and chattery buzz of a vintage oyster bar, but (mostly) fair prices. 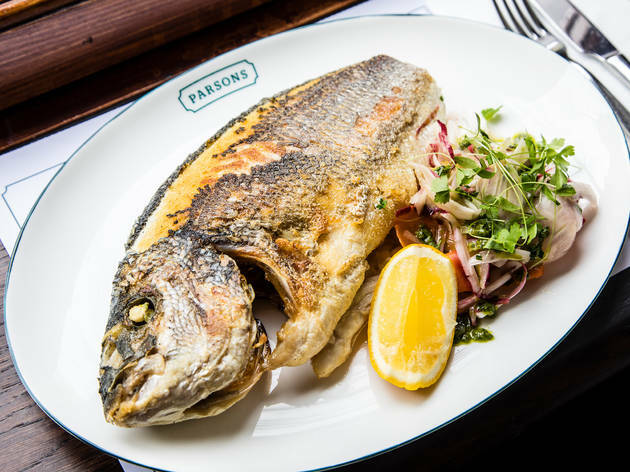 It manages to feel like a neighbourhood bistro (fun fact: Parsons was the maiden name of both owners' mothers, despite them being unrelated). 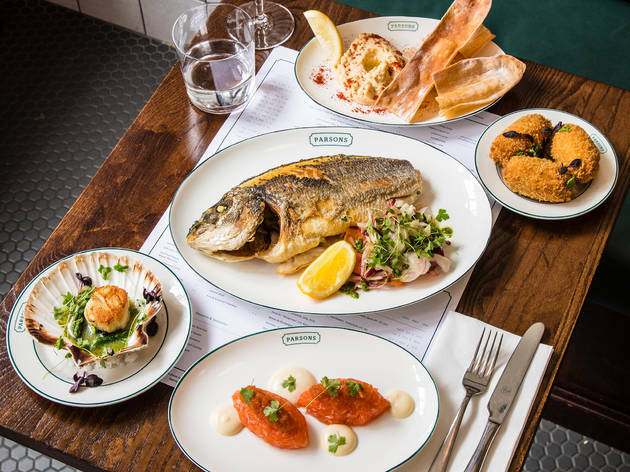 To get all of this, at an address just off of Seven Dials, is almost unheard of. And they definitely won’t lose your coat. Disappointed in the quality of the fish. 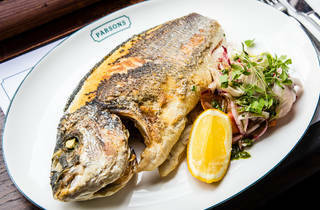 My plaice was not at all fresh and the cucumber and seaweed salad was also not tasty. The snacks were indeed the best part of the meal. Noone inquired if we enjoyed our meal, so was not able to give feedback. 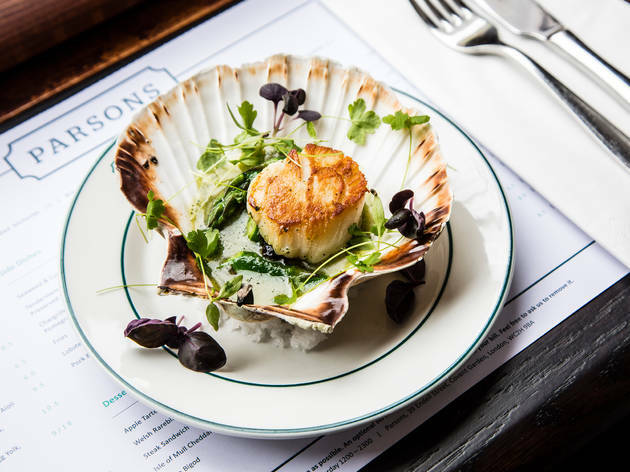 10 Cases is one of my favourite London restaurants, so it was a no-brainer to head straight to Parsons when it opened it's doors across the road. We had a perfect evening there, it seemed like it had been there for years, when it was only it's third dinner service! The decor is lovely, like an upmarket pie & mash shop crossed with a wine bar. We ate delicious seafood and fish, matched with beautiful white wine. Check it out...before everyone hears about it!